There is a lot of focus on prenatal nutrition and care. However, postpartum needs are just as important. Postnatal supplementation and nutrition support the recovery process after giving birth. After the birth is the perfect time to reevaluate your nutritional needs as a new mom. A balanced diet is essential to promote your health and to provide you with the energy you’ll need to care for your new child. Drinking plenty of water, eating the right foods and taking supplements as necessary to fill in the gaps are all important components of an effective postnatal nutrition plan. Drinking plenty of water as a new mom is an important way to reduce inflammation, increase energy and diminish swelling from your pregnancy and delivery. You can start by drinking to your thirst, but it’s important to drink at least six to 10 glasses of liquid, preferably water, every day. Adequate fluid supply is also an important way to promote a healthy milk supply in breastfeeding mothers. A healthy diet is another important factor that promotes postnatal healing and recovery. Directly following the birth, eating when you feel hungry is the way to go, but you’ll want to pay attention to what types of foods that you’re eating—especially if you are a nursing mother—to make sure you’re giving your body what it needs to recover. A balanced diet incorporates all of the primary food groups: grains, vegetables, fruits, dairy and protein. Whole, minimally processed foods will provide you with the highest level of nutrition. Grains – Grains are those foods that are made from grain products such as wheat, rice, oats, cornmeal and barley. Incorporate foods such as whole wheat bread, brown rice and oatmeal. Vegetables – Everyone has favorite vegetables. However, it is particularly important that you vary your vegetable choices postnatal to get an adequate supply of nutrients. Choose a variety of options including plenty of dark green, red and orange vegetables as well as legumes and starchy veggies. Fruits – Fruits are often easy to incorporate into your postnatal diet. Any fruit or 100 percent juice is considered a serving in this food group. You may incorporate any type of fruit including canned, frozen or dried, but fresh is always preferred. Dairy – Getting plenty of calcium into your diet after giving birth is particularly important, so getting an adequate amount of dairy in your diet is a necessity. Choose foods that are high in calcium even if you do opt for low-fat varieties. Protein – Protein helps rebuild the body’s cells and provides sustained energy. Choose lean protein options such as turkey, chicken and lean beef. Fish, nuts, seeds, peas and beans are also good options. The shelves of pharmacies are often lined with several different brands of prenatal vitamins, but there are typically few to no options that are specifically made for new mothers. However, supplementing with the right vitamins after giving birth is important for your physical and physiological recovery. The right supplements are also beneficial to the health of your newborn if you are breastfeeding. Some nutrients found to be beneficial in postpartum recovery are omegas, vitamin B, zinc, calcium and vitamin A.
Omega-3 Fatty Acids – Omega-3s such as DHA support the development of your newborn’s brain, eyes and central nervous system, but these nutrients also play an important role for you as a new mom. Omega-3 fatty acids have also been found to have a positive effect on postpartum depression. The recommended daily amount for new mothers is 300 milligrams. Vitamin B9 – Also known as folic acid, vitamin B9 is important for the development of your baby’s nervous system. It is also shown to help reduce the symptoms of postnatal depression. The recommended daily amount of folic acid needed for new moms is 500 micrograms. Zinc – Zinc is a unique trace mineral that promotes immune function and protects your body from damage from free radicals. Pregnancy can impact how your body absorbs zinc, so many new mothers are zinc deficient. Zinc supplements have been linked to improved energy, an important benefit for new moms. You should aim to consume at least 18 milligrams of this nutrient daily, whether it’s in the form of a vitamin or through foods such as eggs, whole wheat flour, oats and meat. Calcium and vitamin A are also important nutrients for new mothers. A balanced nutrition approach is essential for postpartum mothers, as it helps support recovery and increases energy. An effective meal plan and supplements as necessary is the best way to support postnatal health. 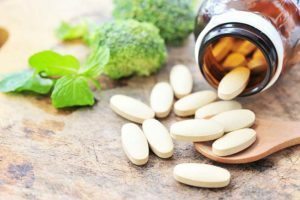 Adding these supplements to your nutrition plan if you’re a new mom can be a good recovery process, but be sure you are taking the right supplements and at the correct times of day to ensure you are getting the proper amounts of nutrients for your optimal health.